Y'know, from time to time, somebody somewhere will come up with a genius new idea. And then, there'll be someone who comes up with someone else's idea, dusts it off and brings it up to date. But people forget about the original, or pretend it never existed. Take J K Rowling, for instance. Harry Potter is far from an original idea, and borrows so many things from other people's stories (especially Enid Blyton), yet no-one (but me) seems to be able to draw the connection. Especially with the whole "Wizard Chess" thing, which was so blatantly stolen from "Battle Chess" it was unbelievable. But no matter, it made her lots of money, and I'm sure she's very happy with herself for that. I wish I could do the same thing without any comeback. Back in the late 90s, though, the fuss was all about one individual bedroom coder, who polished up an old concept of wind, angles and power, the age old game of Artillery Wars. What's that? You don't remember that? It's kind of like City Bomber... every BASIC programmer worth his salt in the early 80s had a crack at recreating certain concepts, City Bomber was one, Artillery Wars was another. Over the years there's been many well known variations, take the QBasic game "Gorilla", which, once I'd discovered it on the school network, everyone was playing (at least until I discovered the Snake game for PASCAL). 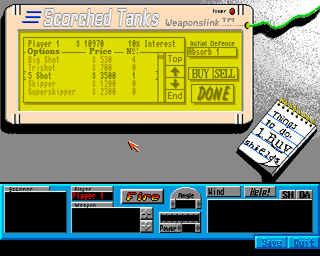 Or then there was the shareware game Scorched Tanks, which I think Amiga Format gave away once. What a cracking game that was. But then along comes Andy Davidson with Total Wormage, "his" concept is snapped up by Team 17, and before you know it, you have a highly successful game on your hands. 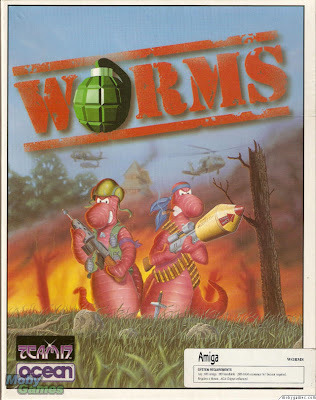 So let's say you haven't heard of Artillery Wars, QBASIC Gorilla, or even Scorched Tanks... you probably heard of Worms. Just in cases, let's give you a quick run-down of the basic mechanics of the game. Traditionally, this genre saw you sat in a gunning station, and you had to choose the angle and power of your shot. You may have hills or a crevasse to shoot over, but normally you couldn't actually move, which left it down to who got the most accurate angle and power quickest. Your shot would tend to travel in a perfect arc, so a good tactic was to start with an angle of something like 85 degrees and full power. Move on a few years, and to a shareware game called Scorched Tanks. This variation added the ability to move (somewhat limited), and a very wide variety of weapons and shields. Ooooh, yes, this one was a real evolution of the concept, with weapons such as the Mega-Nuke, the Cruise Missile, the Dirt Inverter (or something like that) and the Bouncing Bomb. Alright, my memory's a little hazy, I may have got some of those wrong. The important bit is it was a MASSIVE advance from the games of old, with some highly enjoyable weapons to play with. 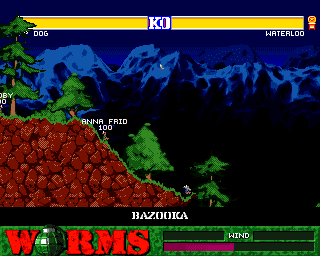 Onto Worms, then. 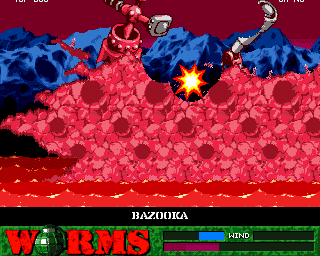 Basically, replace the tanks with Worms, add wind effects and shuffle the weapons about a bit... and there you have it. An all-original concept! Just like Harry Potter and Wizard Chess. OK, so I'm being facetious, and the thing is I'd have every right to be... if it wasn't for the fact that Worms was so DAMN GOOD. I don't know, there's just something of the X-Factor in there, that certain je ne sais quoi. Was it the cartoony violence? Or was it the cartoony chipmunk-like voices? Perhaps it was just the straight-up playability. Or shall we say all these things worked together in Synergy, resulting in something better than the sum of its parts. 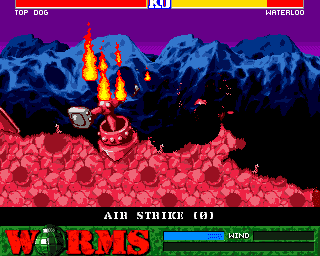 Whilst you could attempt to deplete all your opposition's energy by Airstrikes, or Dragon Punches, you were far better served getting an explosion to knock several opposition worms into the water. Being knocked off the landscape spelt certain (and instant) death, and the slippy, slidey composition of the common worm ensured that being perched atop a hill was not necessarily the best choice of strategic positioning. Weapons wise, they range from the fairly standard range of Bazookas, Homing Missiles, Grenades & Cluster Bombs, to close range weapons like the Uzi, Shotgun & Dragon Punch, to devastating weapons like Dynamite, the Air Strike, Banana Bombs & the amazing Sheep. 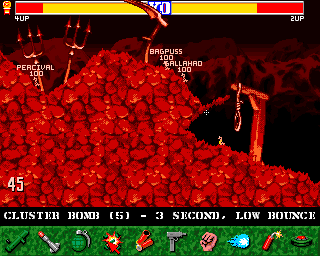 There's also more defensive tools such as Girders and the Ninja Rope, and finally the embarassing Prod. 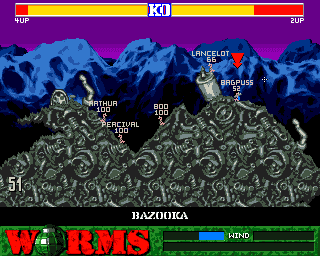 Although a selectable weapon in most versions of Worms, in the Amiga version it was hidden and could only be activated by a certain key combination (in true Mortal Kombat style, the combination was to press away from your intended victim twice, then towards them twice). Take too long and the game enters Sudden Death... all living worm's health drops to 1 point, and the water level begins to rise. The slightest touch of a weapon will kill, and digging your way underground will just minimise your chances of survival. Another interesting aspect to this game was the terraforming... you could either generate a landscape randomly or enter a code or word to recreate a previous landscape. Or, your random word might provide you with an interesting layout just anyway. Try the code "NAPALM", one I discovered very early on... a great tactical map! 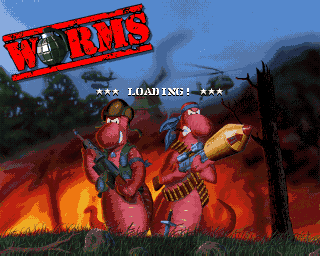 Whilst the original Worms game might be hard to (legally) come by these days, you would only be substituting aesthetic differences by settling for Worms 2 (which was also very popular). But it's worth tracking down given the oppurtunity!